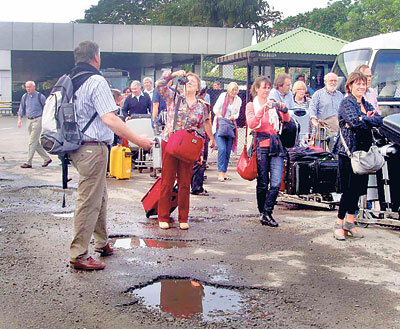 Visitors arriving in the country yesterday must have had a poor first impression – they were forced to walk all the way from the arrival area of Bandaranaike International Airport to the car park. Transport was disrupted because of the poor condition of the road, made worse by the recent rains. While the government is pumping in millions to boost tourism, after the hard times caused by the northern insurgency, essential services are not in place when the foreign visitors arrive. Picture shows tourists taking their first pictures of Paradise isle!